As the deficit worsens, will Trump switch tracks? President Trump’s aggressive stance on trade policy has put the spotlight firmly on the US’ trade balance, which continues to worsen as February’s trade balance of -$57.2bn was the worst since 2008. The US administration argues that unfair trading practices by other countries, and especially China, causes persistent US deficits. There may be something to that argument, in particular when it comes to some of China’s policies. But by focusing on tariffs and other trade-related measures, the Trump administration risks ignoring other factors that influence the trade balance. 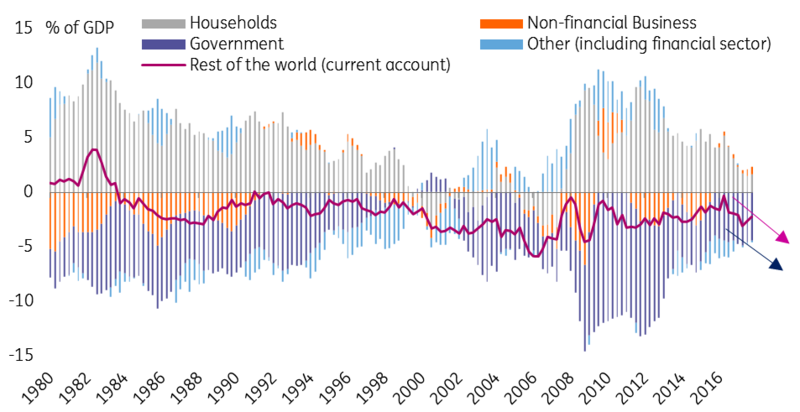 When economists think about current account balance, they tend to frame it as a question of relative demand for a country’s imports and exports. US tariffs and other trade barriers increase the price of foreign goods, and so reduce demand for imports. That would improve the US trade balance. Of course, if other countries retaliate with their tariffs, this reduces the demand for US goods, pushing the trade balance back down. 1. Overall economic growth: this matters a lot because when an economy is growing faster than its trade partners, its demand for imports tends to grow faster than demand for its exports. 2. The currency: when the US dollar appreciates, that makes US exports more expensive for foreigners and imports cheaper for Americans, worsening the trade balance. A depreciation has the opposite effect. 3. Finally, savings and investment decisions affect the current account because an economy that saves a higher share of its income necessarily consumes less and vice versa. That means it imports less. So a higher/lower savings rate leads to an increase/decrease in the current account. In terms of policy, this means fiscal and monetary policy are vital levers that affect trade balance because they influence overall economic growth as well as the value of the currency and the incentives for saving and investing. Regardless of what the US may or may not achieve with its newly aggressive trade policy, these broader macroeconomic factors generally point to an increase, not a decrease, in the US deficit over the next couple of years. That is partly a function of the US economy’s (relative) outperformance over the past few years: the US recovered faster from the 2008-09 financial crisis than its trading partners, especially in Europe, which means US demand for imports has grown faster than foreign demand for exports. In turn, the stronger US economy meant that the Federal Reserve began tightening monetary policy in 2014, even as its counterparts in Europe and Japan were loosening policy. This divergence, combined with the collapse in commodity prices from mid-2014 and the associated slowdown in key emerging markets, caused the dollar to appreciate sharply. From mid-2014 to early 2017 the US’s real effective exchange rate appreciated by nearly 20%. Though the dollar has depreciated a bit over the past year, the exchange rate tends to affect the trade balance with quite a long lag. We think most of the 2014-17 appreciation is yet to be seen in the current account. 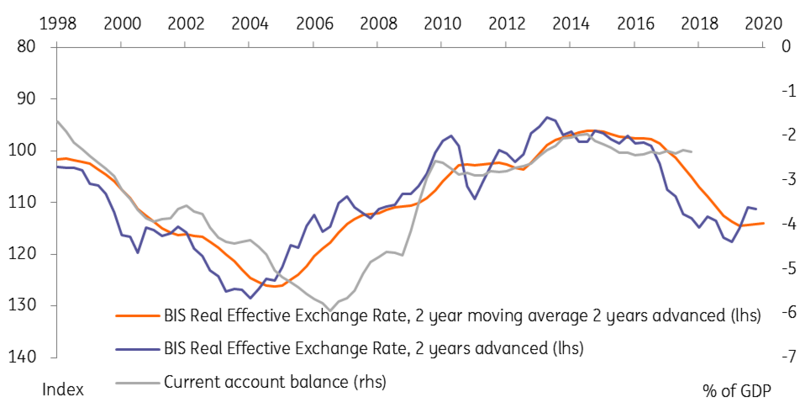 A simple mapping from the exchange rate to the current account suggest the current account could fall to around -4% by 2019. Indeed, monthly trade data suggest the US is on track for a deficit of around 3.5% in 2018. While the divergence in monetary policy is less stark today, with ECB and BoJ tightening finally on the horizon, it is now US fiscal policy that has become the anomaly. Whereas most advanced countries are decreasing their fiscal deficits as their economies strengthen, the tax cuts and fiscal spending passed by Congress recently means that the US’ deficit is set to increase towards 5% of GDP. That puts more money in the pockets of US consumers, which will increase demand for foreign goods and widen the trade deficit further. Finally, the trend in US household savings has been steadily downwards since 2012, adding to demand for imports. Until recently that was off-set by the falling fiscal deficit (i.e. higher government saving). Now that the government’s deficit is set to increase, will households start saving more? That’s far from clear. Given the buoyant US economy and high consumer confidence, we think US households are unlikely to tighten their belts in the near term. Overall, the trend in the US trade deficit is heading in the wrong direction. 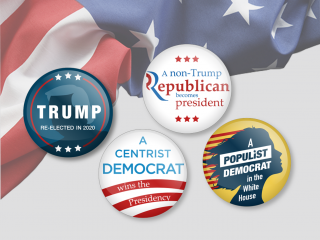 Several fundamental factors argue for a wider deficit over the next couple of years, not the narrowing that the Trump administration is looking for. This could well fuel further aggressive steps to raise trade barriers. But as the administration is finding out, other countries can play tough too. A trade war risks hurting the US economy ahead of the mid-term elections this autumn, without doing much to improve the trade deficit. A different approach would be to tackle to the macroeconomic fundamentals driving the trade deficit wider. That would suggest less expansive domestic economic policy in the US while encouraging a more trade-friendly policy mix (more fiscal spending and less currency intervention) among trade partners. The recent agreement between the US and South Korea on increased FX transparency, tied to the renegotiated KORUS free-trade deal, is a step in this direction, though it may prove difficult to replicate on a wider scale. There are a couple of potential vehicles for widening the discussion around trade imbalances coming up. The US Treasury’s report on Foreign Exchange Policies is expected this month, and the IMF Spring meetings take place in a couple of weeks’ time. But in the current climate, the risk is clearly that rather than constructive discussions, these occasions spark further recriminations and increased tension.